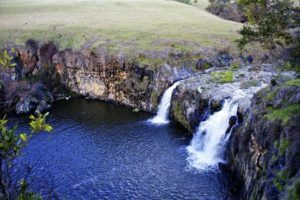 Turpins Falls Scenic Reserve is situated 12.6km from Kyneton and is one of several waterfalls and associated deep pools located along the Campaspe River. Visitors can enjoy scenic views of the falls from a lookout located a short walk from the carpark. No amenities or general facilities, such as toilets or picnic tables, are available at the reserve. Pedestrian access to the waterhole is subject to seasonal track closures during the autumn period due to risk issues. Swimming in the waterhole is not recommended due to the extremely cold water. Access to the top of the falls is permanently closed. Visitors are required to strictly observe all warning signage in the reserve and stay within fenced areas and paths.